I met Robin Black in late 2000 at the University of Pennsylvania Writers Conference, and I agreed to read a few of her stories and give her a little general feedback. I was pleasantly surprised by her work. The stories were better than most of the 3,000 I read each year for the O. Henry Awards, and I was confident she'd be able to get them published if she persevered. Years passed. Then, over lunch with Hannah Tinti and Maribeth Batcha of One Story in early 2008, Robin's name came up. They were excited about publishing a story of hers, "Harriet Elliott." Later, I learned Robin had sold a collection to Random House. 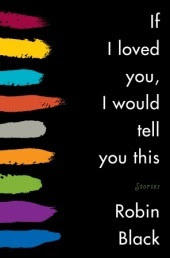 Her book, If I Loved You, I Would Tell You This, is just out, and I'm pleased that we've received it as an entry for The Story Prize. As the first in a series of posts about the story collections we're reading for The Story Prize this year, Robin Black offers her thoughts on her propensity to write short stories that are a bit on the long side. "Because they’re so impractical, nobody I know sets out to write long short stories, though some of us have accepted that we do. In my collection, five of the ten pieces are between 8,500 and 13,000 words and four of those make up all the short(ish) fiction I have written since 2006. What I’ve come to realize lately is that, with my stories anyway, the length is not a matter of extending timelines or of adding secondary plotlines, but of a more qualitative change in the nature of the work. "One of the first things you’re told as a short story writer, just after 'write what you know' and 'chop out those adverbs ruthlessly,' is that everything in a short story should feel necessary—very much as though the writer were on a budget she has to defend. None of this was frippery, I promise! I didn’t buy anything I didn’t absolutely need. For me, the difference between writing a long short story and writing the regular kind is a step away from this requirement of requirement. "So why keep it? Because while it isn’t necessary to the course of the story, it informs the reader’s relationship to the story, if on a largely unconscious level. The scene includes an image of Jean struggling to craft the sling with only one good hand while the fabric slips away from her, and that sense of being unable to hold on lies at the heart of the story. When Jean returns to the guest bedroom later to gauge some disturbances, the reader is not only told what has changed but, having been there before, experiences the differences. "The lure of resonances like those is a seductive one. But still this opens up the question—one I face all the time—of what justifies including elements that wouldn’t be missed by a reader with no knowledge of the original version. The answer for me comes in what sounds suspiciously like a mathematical formula but is actually, like so much in writing, a frustratingly vague combination of intuition, guesswork, and hope: The added length is only justified by an equal or greater added depth. "Not exactly Pythagoras, I know. And it’s a little scary to admit so publicly that I’ve opted to keep elements in stories that I know aren’t, strictly speaking, necessary. It feels dangerously close to saying yeah, this could have used some further editing, I know. Though that’s not what I’m saying, at all. Because, finally, for me, that sense of excess has its own beauty—just as the lean muscularity of other stories does. The aesthetic of spillover suits my intent more closely than the aesthetic of necessity. So maybe at this point it’s time for me to realize that I am writing long short stories purposely, after all—inconvenient career move though it may be. "I just wish we had a better name for the form."